That's probably enough about Prime Ministers for the moment. I kept thinking, reading the Churchill book at work, 'This is not cool, this is not cool', as though anyone who glimpsed the author's name was immediately going to have me pegged down as a militant fox hunting Tory, instead of the bleeding heart vegetarian which is far more the case. Which says more about my vanity than anything, and in any case everyone who did comment seemed rather fond of the old fellow. As indeed they should be. 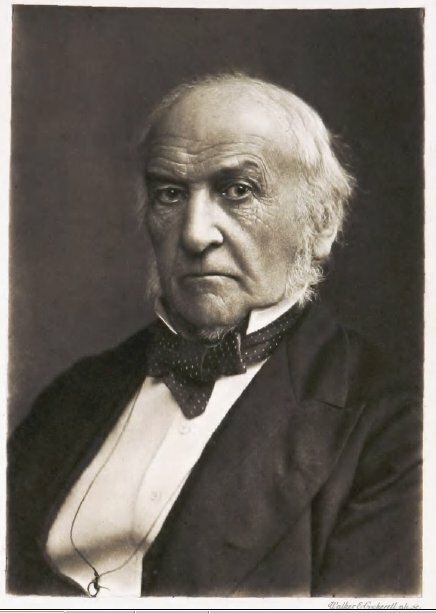 Uploading that splendid picture of Gladstone just now I remembered about this equally splendid recording, from the implausibly named Liberal Sound Archive. Once you've worked out what he's saying (takes about three goes whilst reading the accompanying transcription) it's very endearing indeed. Victorian society? Civilised? I wonder why I thought that. Even if you don't know much about Victorian England, you're going to know that the rich lived well and the poor very badly indeed, so compared to early 21st Century society, it clearly wasn't all that civilised. The word has two meanings though: it relates to class as well as to income, and as class (when it works) is very often a short cut term used to indicate the possession of knowledge, judgement, trustworthiness, the right stuff, its dismantling in favour of social equality, though it removes much that is unfair, also poses questions. What is the right stuff? Who should run the country? Once the short cuts are gone, it becomes necessary to measure everything (via general elections, school exams, government targets), and spontaneity is gone. Adventure uncategorisable. It wasn't always this way. At 360 pages, My Early Life is one of Winston Churchill's shortest books, and (because of this?) one of the most fondly thought of. The Second World War runs to six volumes of around a thousand pages each. 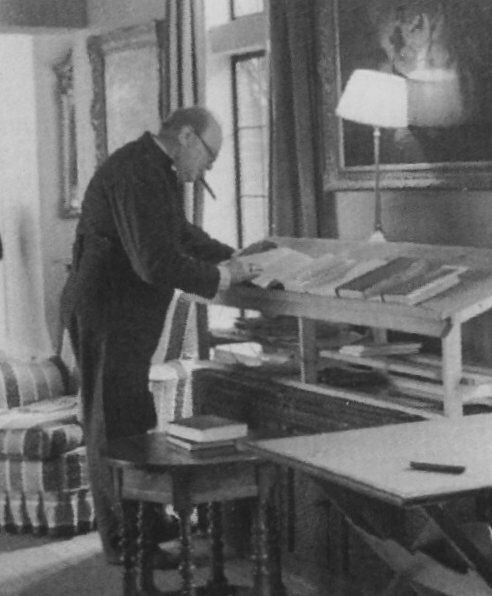 Roy Jenkins' biography describes him at work on his literary enterprises: feeding voraciously on the raw material unearthed by a small team of researchers, he would dictate, standing, pacing, smoking a cigar. In that book there's a picture of him correcting proofs standing up: they are laid out on a lectern-like construction, at which he can read without stooping. The impression one has is of industry, vigour, the marshalling of information (by a team) and the spinning of a web from the resulting materials (by Churchill himself). There is no room in this process for subtlety, finesse (hardly even for revision) to creep in. Over the course of My Early Life this is not a problem. One does not come to Winston Churchill for literary elegance. He can certainly write, but the brush strokes are always broad: the world is his chess board, international events are all-important, minutiae and reflection never figure. Instead, what one gets is a catalogue of intense and exciting action, almost comical at times in its indomitable progression. There's a war somewhere in the world? Let me at it! The front has moved? Give me my leave, I need to get there! It is not enough to sign up and be on call in the same country as the fighting: several times Churchill pulls all the strings at his disposal (including the Prime Minister Lord Salisbury when things are looking particularly bleak) to get to the thick of it. The military commanders understandably become increasingly irritated at this unilateral pre-emption of their decisions about staff movements by a Subaltern. Churchill is blithely unconcerned about this. Precocious is not the word. It is difficult to see these activities, at once brattish and noble, as being entirely in the interests of self-advancement. They are more to do with a young inexperienced soldier / politician / journalist throwing himself through as many difficult situations in as short a time frame as he can manage. They are a preparation for life. They are a natural extension of his intense interest in the world around him, more than in himself or his own place within it. They demonstrate a capacity to see world events from several removes, combined with a hunger to place himself in the least removed spot of all. Churchill knows no other way to behave. It simply doesn't occur to him not to do these things, to (to take the most famous example) take charge of rescuing a military train he's on which has been ambushed and partially derailed by Boers, at great personal peril, and despite the fact that officially he's no longer a soldier but a reporter for the Morning Post. Wasn't that a job for the officers on the train? Later on, once (after the train episode) he's been taken prisoner, a plan he hatches for escape runs on considerably. He proposes not simply that a group of officers escape from their compound (and it is unclear why he is in the officers' compound at all) but that, once out, they make their way to the larger POW camp for privates, steal some guns, release them and then invade Pretoria! On this occasion military rank is pulled, and the outrageously ambitious plan is vetoed. He settles for just escaping himself. Once the reader falls in with Churchill, gives their trust to this agreeably loose cannon, there is really no way not to enjoy the book. His ambition may be sky high, but it is strongly anchored. He has a degree of self awareness, in that he realises the preposterous scale of some of his schemes and is quite happy for others to talk him out of them. He also has a sure moral sense. This sits slightly awkwardly with his Tory (or at least his conservative) side. Full of respect for rank and antiquity, and with a corresponding appreciation of the good things in life (champagne, wealth, prosperity – the introduction states proudly, as though it were from an ancestral home, that the book was written 'at Chartwell'), Churchill nonetheless has a compassion unusual in someone with such tendencies. Though he is all for fighting wars without holding back when they are necessary, he has a respect for the enemy and doesn't want to see them unfairly treated once hostilities are over. If this sounds a safe, bland position to take, it was certainly not one adopted by his fellow party members, who wanted to exact revenge in peace time for injuries inflicted during war. They felt a loyalty to Britain, whereas Churchill felt, much more broadly, that a man must be loyal to his nation. A Sunday spent in bath and bed, ploughing through Roy Jenkins' Gladstone, of which there's still plenty to go. It's currently 1874: Gladstone's 67 and gearing up (or at least the temporally sweeping narrative is gearing him up) for the two more premierships which will take him into old age and... what? Something to do with the Irish, we're told, and a faint glimmer of GCSE History lessons involving the words 'Home Rule', 'Fenian' and 'Parnell' appears through the murk of my mind. I was never very good at History. I took it for A-Level too because it sounded like a nice arty thing to do, sitting well with Art and English. In fact it turned out to be entirely divorced from both. The others offered imaginative scope, the exercise of that part of the brain which is exempt from classification, whereas History might as well have been Physics with all its facts and figures. Richard III did this (or did he?) and Henry IV that, and someone killed himself eating too many apples at a banquet. 'Who cares?' I thought, and drifted back to the intangible regret of Brideshead Revisited. If you explain something you kill it, like a photograph stealing a soul. Roy Jenkins is good at explaining things, but it's the way he does it rather than the fact itself which makes me like his books. Pithy, amused, at once economical and florid (via the ludicrously wide vocabulary: 'shibboleth', anyone? 'dithyramb'?). It helps that Gladstone with all the contradictions of his personality is manifestly inexplicable. Striding over 20 and 30 mile stretches of countryside as a matter of course, chopping down trees (his own and other people's) and talking to prostitutes by way of recreation, struggling with weighty matters of Church and State in pamphlets with which no-one in the world precisely agrees and which do no good at all to his political career. He cuts a wild flailing dash. It's in these terms, and not those of political significance, that I've been reading the book. Names of colleagues, movements, factions come at an alarming rate, inviting the regular use of an encyclopaedia in addition to the necessary dictionary. It's also possible just to take these things as read and enjoy the sweep. By now I've worked out that 'Whig' more or less equals 'Liberal', and 'Peelite'... I'm none too sure, except that Peel himself fell off a horse and died aged 50. These things take on meaning by repetition in any case, and if not a literal one, certainly one of the texture of the era. That this is Victorian England is evident at every turn, from the gradual advance of rail travel to the elaborate written language of contemporary sources (not to mention Gladstone's own tortuous prose, quoted sparingly), and unsuspected nuggets such as: the weekend is a 20th Century creation. Legislation on basic things such as primary education for all and giving commoners the vote jars when you realise it wasn't already in place, in this most civilised of societies.